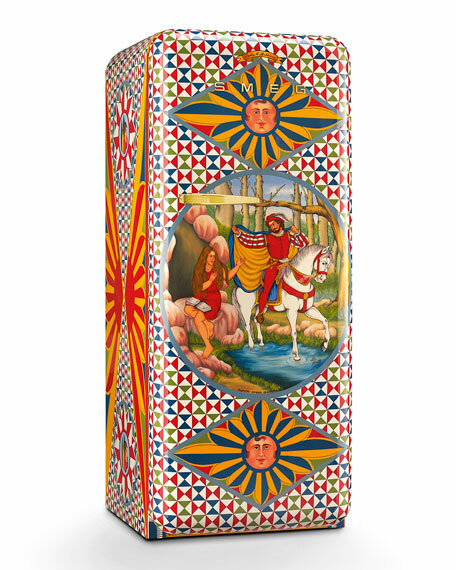 Unique 1950s style single-door refrigerator hand-painted with "Saint Geneviève", by Michele Ducato, in cooperation with Dolce & Gabbana. 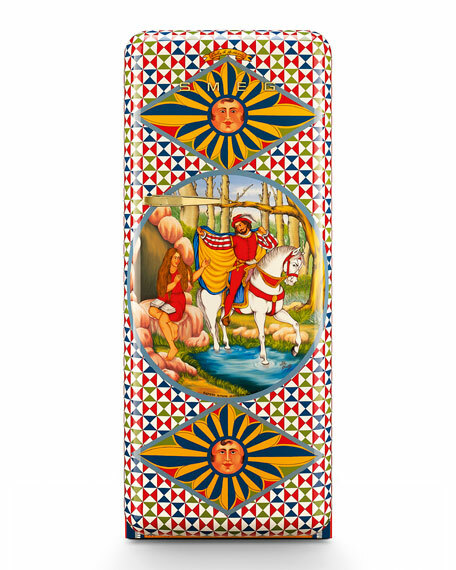 The Sicilian cart and its traditional iconography are the sources of inspiration for the scenes painted on this refrigerator. The story of Saint Geneviève is the main theme: the front panel describes the episode of finding her in the forest. Around the central oval that frames the scene, marvelous geometric figures burst with colour, emphasizing the stidda (star) and mascaruni (sun) motifs. The fret patterns continue onto the sides, where the auspicious image of the ancilieddu (little angel) appears repeatedly. 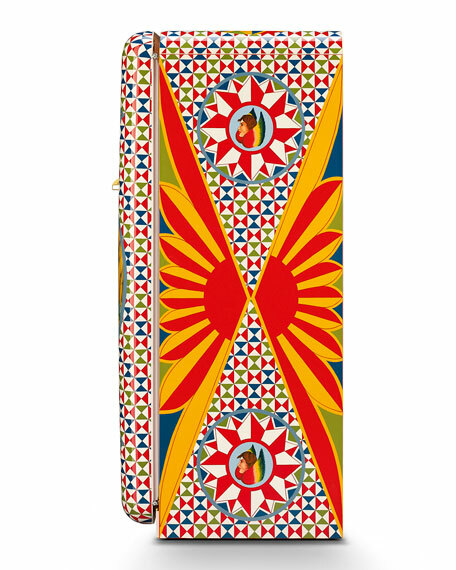 The trinacria, undisputed symbol of Sicily, graces the top. 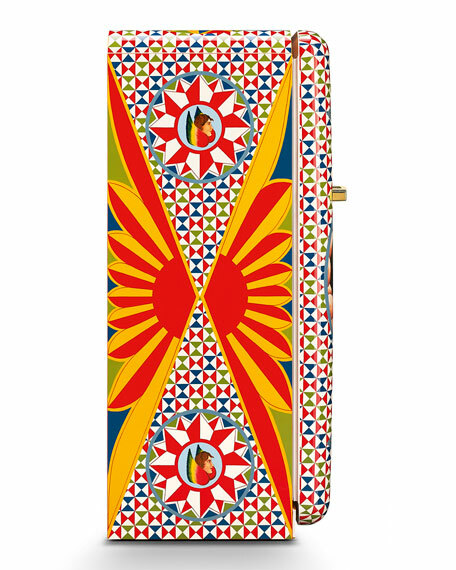 27.5"W x 23.6"D x 57.5"T.
Care: The refrigerator compartment has automatic defrosting. During normal operation of the refrigerator, frost forms on its back wall when the compressor is working and dissolves when it is not in operation. When the compressor is not working, the frost which has built up on the back wall melts and the water flows into the opening provided in the bottom of the body of the refrigerator. From here, it flows into the tray on the compressor, where it evaporates. The freezer compartment has to be defrosted manually. When the thickness of frost or ice on the shelves exceeds 0.75" or 2 cm, the freezer should be defrosted. A few hours before defrosting, use the knob provided to set the thermostat on 7 in order to further lower the temperature of the frozen foods. Then turn the knob to the 0 (STOP) setting and disconnect the plug from the electrical mains. Remove the frozen foods from the freezer compartment and protect them from thawing while cleaning. Place a container underneath the pipe to collect the defrosted water. Clean both refrigerator and freezer compartment about once a month to prevent odors from building up. Handcrafted wine cooler. Stainless steel with clear enamel coating. Pieces may vary due to the handmade nature of each product. Handcrafted wine cooler. Stainless steel with clear enamel coating. 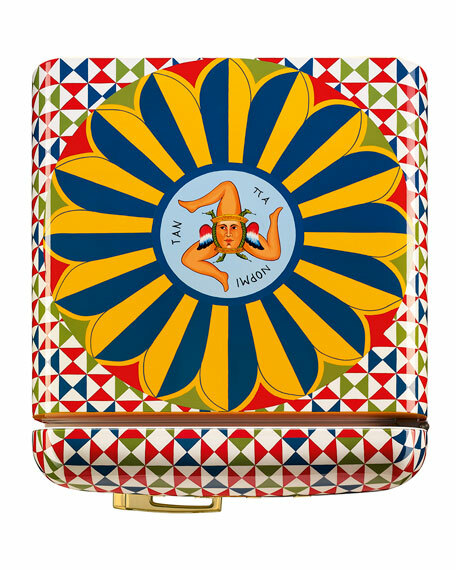 Pieces may vary due to the handmade nature of each product. Hand wash with mild soap and dry immediately. 4.75"Dia. x 7.75"T. Imported.